Did you know that before going to a hospital or consulting a doctor, more than 80% patients like to research on Google for the best doctors & hospitals, and, learn more about their problem? Have you ever evaluated the strength of your online presence? 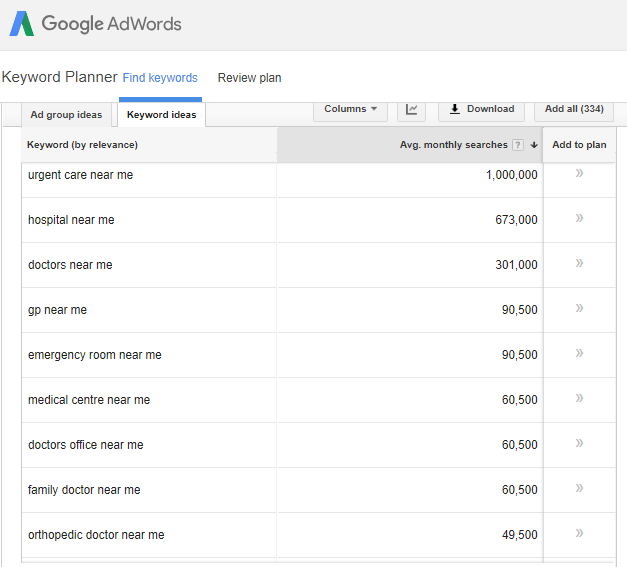 Can patients find you easily using common keywords related to your field? Do you want to increase the number of patients visiting your hospital or clinic? If yes, then you should be ranking at the top in Google. You need to ensure that your website has maximum information that prospective users might be looking for and the right pages are ranking for the right keywords. Don't worry we will take care of all that. You see, internet provides a level playing field for everyone and in order for your website to reach top positions in Google you need the best search engine optimization techniques applied to your website. That's what marketing teams of top ranked doctors and hospitals are doing to stay on top search engine positions. We provide high quality Medical Seo (Search Engine Optimization) services. Our experienced SEO teams will perform all the necessary optimizations for your website and use strategic content marketing tactics, so your website gains a massive search engine presence. In addition we have a dedicated content writing team that specializes in writing high quality & well researched content for the Medical & Health industry. Wondering how it will work? It's simple, we will create a clear-cut customized SEO strategy for your website which will ensure that your website ranks for even the most competitive keywords in your industry. We specialize in providing Medical Search Engine Optimization services. Having years of experience in this field, the SEO strategy we will formulate will be a unique comprehensive combination of several online marketing activities. To summarize briefly, there are 4 most important parts of SEO: First, the quality of content & on-page optimization of your website, Second, how good is your overall online presence or how well your web pages are marketed/linked across the World Wide Web, Third, how search engines interpret your web pages, and, Fourth, your website's user experience. Your website will rank above other websites only when Google thinks, that your website, is better than your competitors, in all the four aspects. At SEO Web Up, we take care of each and everything related to the SEO of your website. We provide the most comprehensive range of SEO services for your specific requirements. A one stop provider for all your SEO needs, we do everything under one roof, from target page to content creation and fixing on-page/on-site issues, to content promotion via social media and quality link building. As a leading SEO company with a highly talented SEO team, we create custom SEO strategies and provide online-marketing concepts that yield great Returns on your Investments. We don't bother our clients with unnecessary SEO reports filled with marketing jargon. The fortnightly & monthly reports we send are very clear & comprehensive. Why Choose SEO Web Up? We provide high quality Search Engine Optimization services for our clients in Singapore. We strictly follow White Hat SEO techniques and use cutting edge SEO strategies. In addition to the best SEO experts, we assign a highly experienced SEO Account Management Team for our clients, who is responsible for client communication and project delivery. The Account Management team is available for communication 7 days a week in Singapore timezone/s i.e. UTC +8 - SGT (Singapore Time). Fortune Global 500 & Other Top companies	 Companies in the Fortune Global 500 group are Trafigura Group, Wilmar International and Flextronics. Other notable companies include, 2C2P, Aetos Security Management, AIBI International, Antlabs, Aspial Corporation, Ayam Brand, Bee Cheng Hiang, Boustead Singapore, BreadTalk, Broadcom Limited, CapitaLand, Carousell, Certis CISCO, Charles & Keith, China Aviation Oil, ComfortDelGro, Creative Technology, DBS Bank, dnata Singapore, Far East Orchard, Far East Organization, FilmTack, Flextronics, Fraser and Neave, Garena, Genting Singapore, GlobalRoam, Golden Agri-Resources, Grab, Great Eastern Life, Hyflux, Jetstar Asia Airways, Jurong Port, JTC Corporation, Keppel Corporation, Koufu, M1 Limited, Mediacorp, MyRepublic, Near, Neptune Orient Lines, NTUC FairPrice, OCBC Bank, Osim International, PSA International, Pacific Century Regional Developments Limited, Popular Holdings, POSB Bank, Quest Global, Renewable Energy Corporation, SATS Ltd, SBS Transit, Scoot, SearchTrade, SembCorp Marine, SIA Engineering Company, Singapore Press Holdings, SMRT Corporation, SGAG, Sheng Siong, SilkAir, Singapore Airlines, Singapore Airlines Cargo, Singapore Exchange, Singapore Petroleum Company Limited, Singapore Power, Singapore Post, Singtel, ST Engineering, StarHub, Systems on Silicon Manufacturing, Tangs, Tee Yih Jia, Temasek Holdings, Thakral Corporation, Tiger Airways Holdings, Twelve Cupcakes, Venture Corporation, Vertex Venture Holdings, Ya Kun Kaya Toast, Yeo Hiap Seng, and Wilmar. Languages Spoken	 The major languages spoken in Singapore are English, Malay, Mandarin Chinese, and Tamil. Most Popular Websites	 google.com, google.com.sg, youtube.com, facebook.com, yahoo.com, instagram.com, wikipedia.org, twitter.com, reddit.com, live.com, carousell.com, qoo10.sg, whatsapp.com, google.co.in, baidu.com, dbs.com.sg, lazada.sg, linkedin.com, amazon.com, netflix.com, tumblr.com, hardwarezone.com.sg, straitstimes.com, singtel.com, channelnewsasia.com, taobao.com, office.com, ampproject.org, wikia.com, nus.edu.sg, quora.com, jobstreet.com.sg, singaporepools.com.sg, news.yahoo.com, github.com, uob.com.sg, microsoftonline.com, apple.com, kissanime.ru, pinterest.com, ocbc.com, microsoft.com, tripadvisor.com.sg, and singpass.gov.sg. Medical Seo requires an awesome SEO strategy, including Content, On-page and a Backlink strategy. The content we create will be verified, original, unique, high quality & non-plagiarized. We understand that as medical specialists marketing is not your top priority. However your Search Engine presence plays a very important role in determining your online presence and thus shouldn't be pushed aside. A good search engine presence will not just increase the number of patients visiting you, but will also enhance your overall value. People are more likely to trust service providers with a good online presence. Medical Seo is in high demand in Singapore. As below image describes how even the simplest keywords have such high monthly search volume. 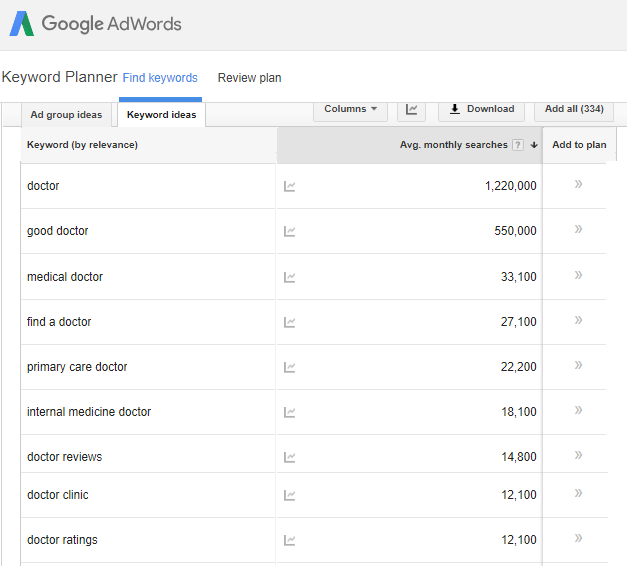 Not just general keywords but in Singapore, location based keywords are also considered high value terms in Medical Seo . Therefore besides regular keywords we will also optimize your website for location based keywords. The SEO strategy we will create for you will depend on the current state of your website and the specific user-base it serves. For example, a brand new website will need more off-page optimization than a website that has been there for few years. Also keyword competition for different categories vary dramatically, which too effects the SEO strategy for a website. As a leading SEO company with a highly talented SEO focused work force, we build custom SEO strategies and create online-marketing concepts that yield great Returns on your Investments. Our systematic approach to defining the SEO Strategy for Medical Seo includes a wide array of factors. It's only after a rigorous competitor analysis that we define a tailored SEO strategy for our clients. Keywords are the words or phrases search engine users use to find information. The first step in keyword research for Medical Seo is to enumerate the possible keywords and evaluate their keyword competition. Then using tools such as Google's Keyword Planner we create a list of many thousand closely related keywords. Using our experience we select the best handful of keywords from these thousands of keywords. The two main aspects we evaluate when shortlisting keywords, are Keyword Relevance and Keyword Competition. Why? Since a slight change in a keyword can drastically change the nature of visitors coming to your site, therefore relevance plays a key role in determining the keywords. For example, we as an SEO Company could have targeted the keyword SEO in comparison to SEO Company, but that would bring in general visitors who might just be looking for a definition of SEO. However "SEO Company" would more likely be searched by people who are actually looking for an SEO Company. This brings us to the next aspect i.e. Keyword Competition. While on one hand targeting only the keywords with low search volume would be less fruitful, on the other hand targeting highly competitive keywords at the beginning of a campaign can be disastrous as well. We have to be very practical when setting Keyword goals, therefore we keep a mix of long tail (which comparatively have lesser search volume) and short tail keywords (which generally have higher searches). We have to dig very deep into the goods or services that you wish to target. Selecting the right niche keywords can bring in quick results and thus a higher ROI. Unlike PPC campaigns, in Search Engine Optimization we have to be very careful when selecting the keywords that we will target. As such everything, right from content optimization to back link creation are created keeping these keywords in mind. All the SEO work is done for these selected handful of keywords. We need a very good strategy and have to think from the point of view of a search engine user. Will the search engine user find what he is looking for and will he or she like reading your web page? Exactly how much relevant the content on this page is to the selected keywords for that page? These are some common questions which we have to answer before selecting a keyword. This process of selecting a handful of target keywords is called Keyword Analysis and is the most basic aspect of any SEO campaign. It is also the first step of our SEO strategy. Understanding which keywords are right for you and how they can maximize your ROI is the basic essence of SEO campaigns. As keywords drive the whole SEO campaign, they have to be perfect. There also comes a point when we achieve the desired rankings, at which point our SEO team upgrades the keyword strategy. This is important because the complete SEO strategy revolves around keyword strategy, and we have to upgrade it as and when we achieve the set targets. According to Google, for a typical query, there are thousands, even millions, of web pages with potentially relevant information. As search engine users we just want the right pages with great content and not any irrelevant results. Google also wants to serve useful and relevant results, not billions of web pages. So to make the best pages rank first, Google uses complicated algorithms to evaluate how useful these web pages are. It is this "usefulness" that we as SEO experts optimize on the target pages of your website. The more useful a page, the better chances that it will rank higher on Google. Another very important, but related factor which Google evaluates is the value of content throughout your website. Google is more likely to trust a website with regularly updated high quality content. Therefore depending on the keyword competition, a good content strategy for Medical Seo requires creating many more pages of related content throughout your website. At SEO Web Up we follow a content oriented approach for SEO. Our specialized team of Medical Seo content writers will regularly create great content for your website. We also ensure that the content created is high quality & original so that Google regards your website as a much more authoritative source of information than other competing websites. Competitor analysis is the process of analyzing your competitors and the SEO strategies used by your key competitors. It also involves determining which keywords your competitors are ranking for and then reverse engineering to find out the missing SEO aspects from your website. When doing a competitor analysis for clients, we analyze various aspects of the websites featured on the first page of Google SERPs. These include SEO factors like, Link Profile Strength, Web page & overall quality of their Website Content, Keyword Density, On Page Optimization, Structured data markup, User Experience, Mobile Friendliness, Website Page Speed analysis, Social Media strength, and Internal Linking. SEO is mix of various online marketing activities, and depending on the keyword competition and the current search engine value of a website, we have to carve out a path that will lead to your sureshot search engine success. As such Competitor Analysis starts during Keyword Analysis. Before finalizing the keywords we have to figure out what is working in favor of the top ranking websites. We have to be 100% sure that we are not chasing keywords that won't provide a high ROI. The keywords we should target should drive both visitors & conversions, and help achieve your online marketing goals within an appropriate time period. Backlinks are a very important aspect of SEO. Google wants to serve authoritative web pages to its users and back links are one of the most important factor that helps build your website's authority. Good back-links will help you get ranked and without back-links, it is hard to rank for even the simplest keywords. Another reason why back-links are so dear to search engines, is that bots such as Googlebot finds new web pages with the help of back-links. So the more you are linked the better chances your web page will be found naturally by Googlebot. The bottom line, if you want to rank high you need to acquire quality back links for your website. Please remember, any links intended to manipulate PageRank or a site's ranking in Google search results may be considered part of a link scheme and a violation of Google’s Webmaster Guidelines. This includes any behavior that manipulates links to your site or outgoing links from your site. Additionally, creating links that weren’t editorially placed or vouched for by the site’s owner on a page, otherwise known as unnatural links, can be considered a violation of Google's guidelines too. "The best way to get other sites to create high-quality, relevant links to yours is to create unique, relevant content that can naturally gain popularity in the Internet community. Creating good content pays off: Links are usually editorial votes given by choice, and the more useful content you have, the greater the chances someone else will find that content valuable to their readers and link to it." Google's Mission Statement is "To organize the world's information and make it universally accessible and useful." However Search Engine Optimizers (SEOs) have a mission to improve the rankings of their client's website. And in order to achieve their goals many SEOs resort to manipulative techniques, instead of using White Hat SEO techniques, to trick search engines and make quick progress. For example, Search Engine Optimizers knew the power of backlinks very well and started misusing their knowledge to create spam links. All this messed up the search engine results and search engines had to make appropriate changes in their algorithms. As search engines got smarter at fighting spam link schemes, SEOs had to work towards acquiring natural links. As a result if your website was negatively affected by Google Penguin, we know that there was something wrong with your back links and that we need a thorough evaluation. Google like most other popular search engines, keeps updating its search algorithms to maintain the quality of search engine results and to fight spam. While a large number of such updates are minor, there are number of other updates that have a significant impact on search results, such as, Google Hummingbird, Google Mobile Friendly, Google Panda, Google Penguin and Google Pigeon. Google publically informs about most of these significant updates on their various webmaster networks. When we strategize a Medical Seo campaign we keep a close eye at any (positive or negative) relation between such updates and your website. Just looking at how Google treats your website, post these updates, we can better evaluate the exact positive or negative aspects of your website in light of that specific update. While relevant back-links are certainly important, it is only because of their connection to the on-page SEO factors. So what are these on-page SEO factors? These include various elements such as the Title Tag, URL structure, Heading tags, Images, Videos, Info graphics, Keyword density, Keyword occurrence, mobile friendliness, Outbound links, Internal links, Page speed, Keyword synonyms, Image optimization, Length & quality of content, originality of content, Meta tags, Important HTML tags related to the semantics of your web page, such as em & strong, breadcrumbs, and, additional markup such as Schema and Rich snippets. When we optimize a website for Medical Seo we optimize each and every on-page element for all the target pages. In fact in the first month itself we will complete all these on-page SEO activities. When search engines such as Google says that relevance is a key important factor in ranking a page, they are mostly talking about on-page SEO factors. User Experience (UX) refers to the quality of experience your website users have when visiting your website. When ranking a website Google takes into consideration it's UX as well. A good rule of thumb is to evaluate if your website visitors can easily find whatever they are looking for. Therefore in addition to helping users take necessary action in order to achieve your business goals, your website layout, its page speed, the colors, images, content and forms, all play a major role in achieving a good user experience. Our UX team evaluates eight main aspects of the target pages of your website, which includes Content Quality & Keyword Intent, Ease of Usability, Information Architecture, User Interface Design, Interaction Design, Visual Design and Accessibility. Page speed is an important ranking signal. This means that if all other factors remain same, your website could perform better or worse in Google Search just depending on your page speed. We use tools such as Google Page Speed Insights to measure and optimize page speed of all target pages. Google had seriously started emphasizing on Page Speed from the year 2009. It had mentioned several times across their Webmaster blog posts about their own research on page speed and indicated just how much obsessed Google is with your website speed. Here is an excerpt from one of their blog posts "Speeding up websites is important — not just to site owners, but to all Internet users. Faster sites create happy users and we've seen in our internal studies that when a site responds slowly, visitors spend less time there. But faster sites don't just improve user experience; recent data shows that improving site speed also reduces operating costs. Like us, our users place a lot of value in speed — that's why we've decided to take site speed into account in our search rankings. We use a variety of sources to determine the speed of a site relative to other sites." The ease of using Mobile Search has led to a mobile search revolution. To the extent that people use Mobile search more often than desktop search. This trend had picked up long before, as a result of which, Google began rolling its global mobile friendly update back on 21st April, 2015, thereby improving the rankings of mobile-friendly pages in mobile search results. When we optimize a website for Medical Seo we build a unique social media strategy and create posts across a wide variety of social media channels. This helps in keeping your followers engaged, building up your Web 2.0 presence and augmenting the process of Natural Link Building. As Social Media channels such as Facebook can be easily gamed, hence they are not regarded as a direct ranking signal. However their importance shouldn't be underestimated. There are various reasons that go in favor of social media. First, as social media websites are all about connecting with other people they have huge potential for quality back links, second, social media sites are great place to share high quality useful content, third, social media sites can be very useful when it comes to creating or promoting a brand, fourth, with billions of users channels such as Facebook and Youtube can help quickly build a very huge audience, fifth, social media links are also back links, so at the end of the day when you are seriously promoting your content on social media channels, you are in itself creating links for you website. Google has gotten smarter at distinguishing between profiles with genuine and fake followers. This is why we often see social media pages with genuine likes and followers rank high in Google and web sites with a strong social media presence also have a better scope at ranking higher. Google Analytics is an awesome tool for measuring & tracking your website visitors. You can see which keywords are performing, distinguish between organic and other visitor sources, see how they are behaving and which are the main landing pages, so you can better optimize them to increase the conversion ratio and use them to their fullest capabilities. It's an easy to use ultrafast tool that helps you gain advance insights and create all sorts of reports about your site visitors. In short, a must have tool for online marketing. Here's what Google has to say about it's Analytics tool "Whatever your industry – travel, automotive, healthcare, or beyond – Analytics helps you get a deeper understanding of your customers so you can deliver better experiences and drive results. Analytics makes it easy to understand how your site users are engaging with your content, so you know what’s working and what’s not. See how people are interacting with your sites and the role that different channels play by viewing robust reports and dashboards. You can even connect systems used to measure CRM, points of sale, and other touch points with your customers for a more complete view. Use Google’s unique machine learning capabilities to discover new insights from your data — such as which users are likely to convert or which customers have high revenue potential." While Google Analytics is used to measure & track people visiting your website, Google Search Console is the #1 recommended tool purely from SEO perspective. Google Search Console is a free service offered by Google that helps you monitor and maintain your site's presence in Google Search results. You don't have to sign up for Search Console for your site to be included in Google's search results, but doing so can help you understand how Google views your site and optimize its performance in search results. Some benefits of using Search Console are, It helps you monitor your site's performance in Google Search results, Makes sure that Google can access your content, Submit new content for crawling and remove content you don't want shown in search results, Create and monitor content that delivers visually engaging search results, Maintain your site with minimal disruption to search performance, Monitor and resolve malware or spam issues so your site stays clean, Discover how Google Search—and the world—sees your site, See which queries caused your site to appear in search results, See a sample of sites which are linking to your website. A sitemap is a file where you can list the pages, videos, and other files on your site, and the relationships between them. It helps in informing Google and other search engines about the organization of your site's content. Search engine web crawlers like Googlebot also read this file to more intelligently crawl your site. Your sitemap can provide valuable metadata associated with the pages you list in that sitemap: Metadata is information about a webpage, such as when the page was last updated, how often the page is changed, and the importance of the page relative to other URLs in the site. In addition if a site pages do not naturally reference each other, we can list them in a sitemap to ensure that Google & other search engines do not overlook some of these pages. Internal links are links pointing to other pages within your website. There are many benefits of using Internal Links. First and foremost internal links are great for user experience. As website users can easily jump to more relevant content using these links, they become a great source to grip your site visitors. This is an important SEO strategy used by Wikipedia. Second, internal links pass on link juice across all your internally linked pages. Third, as we have full control over our internal links they become a great source to build up the relevancy quotient for pages that other sites might not link to naturally. Fourth, internally linked pages can be found by Googlebot and are thus easily crawled and indexed by Google. When done right Internal Links transform into a very powerful SEO tactic that has huge benefits. In order for Google or any other search engine to rank a webpage, it first needs to crawl that webpage and create it's index. Googlebot creates large indexes of the words and several other elements it can find on these webpages. Thereafter it processes key page tags and attributes, such as Title tags and ALT attributes before ranking a webpage. Now and then we often see webpages that Google couldn't crawl successfully. As a result these pages loose their rankings and if found in large numbers, it will negatively affect the ranking of other pages on that website. Common issues affecting your website crawlability include DNS errors, Not followed errors, Server connectivity issues, and robots.txt error. The web is like an ever-growing library with billions of books and no central filing system. Google uses software known as web crawlers to discover publicly available webpages. Crawlers look at webpages and follow links on those pages, much like you would if you were browsing content on the web. They go from link to link and bring data about those webpages back to Google’s servers. The crawling process begins with a list of web addresses from past crawls and sitemaps provided by website owners. As Google crawlers visit these websites, they use links on those sites to discover other pages. The software pays special attention to new sites, changes to existing sites and dead links. Computer programs determine which sites to crawl, how often and how many pages to fetch from each site. When crawlers find a webpage, Googles' systems render the content of the page, just as a browser does. It takes note of key signals — from keywords to website freshness — and keeps track of it all in the Search index. The Google Search index contains hundreds of billions of webpages and is well over 100,000,000 gigabytes in size. We would love to work for you. Here are our most popular SEO packages recommended for Medical Seo . We want to help you extract the most out of World Wide Web and capitalize on it's phenomenal marketing reach. We truly believe that it is only when our clients grow, that we will also grow. If you are a start-up we recommend that you should use the PRO SEO package, see the results, and then move to a higher plan. Hospitals or bigger group of doctors, who have a good team at hand, that can handle large number of patients can start with a higher package such as the Premium or the Elite SEO package. Our SEO team consists of the best content researchers, content writers, graphic designers, on-page SEO experts, outreach experts, back-link specialists, social media experts and an excellent account management team. Our SEO experts will build strategic SEO solutions for your website. The Content Writing team works in close association with the Content Research & Content Marketing team to create original, high quality content which attracts good backlinks naturally. In addition the best SEO professionals perform all the on-page optimization for the target pages and the fresh content we keep adding month on month. The Back-link Specialists & Outreach Experts will create top notch links that helps in building your website's authority. And our Account Management team will constantly remain in touch with you, keep you updated about the work progress and send all the fortnightly & monthly reports. All these activities are performed under the scrutiny of a highly passionate top-level management. With over 10 years of experience in the field of SEO, we have pretty much mastered the art of SEO. We know exactly what works and to what extent for which website. Our efficient SEO strategies have helped many businesses grow by leaps and bounds. We deliver organic Search Engine results that greatly impact your bottom-line. Our affordable SEO Packages start at amazingly low rates and include all costs such as Content writing, Target page creation and Social Media Optimization. We strictly follow White Hat SEO techniques to ensure long lasting results. Our SEO strategies are fully customized accordingly. How popular Search Engines work?